Christmastime is family time. It’s a time for families to enjoy each other’s company, relax, and make memories. It’s a time when we look forward to our family traditions, no matter how simple they may be, because they bring us together after a long and busy year. As a parent, my favorite traditions are our Christmas morning traditions. Having Christmas morning traditions not only helps families to make memories; they also serve as transitions during a sometimes crazy Christmas morning routine. With four kids, things can get a little crazy for us on Christmas morning. While their goal is to dive into the presents and tear all of them open (totally fun though, right? ), I want them to take their time and remember what Christmas is all about and spend quality time as a family. If you know me, you know I like to keep it simple and practical. 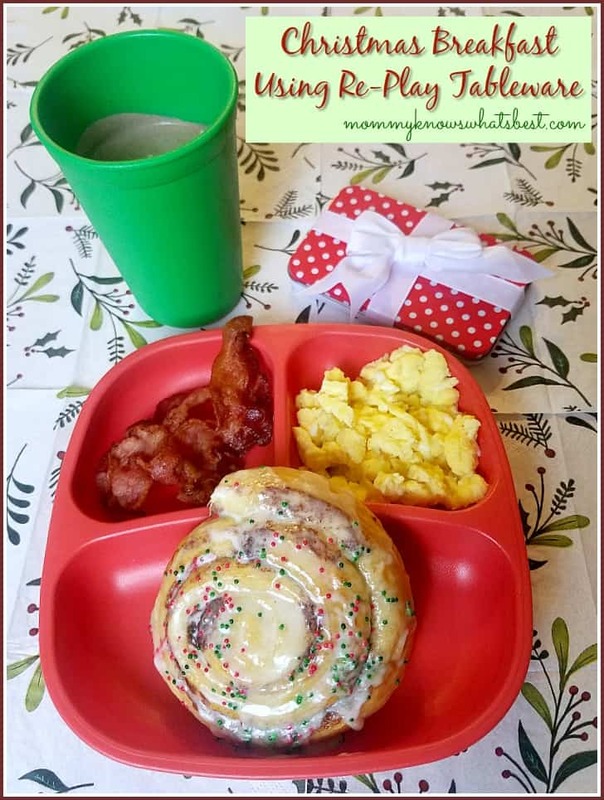 Here are 3 simple Christmas morning traditions that anyone can use for their family. Be sure to leave a comment below sharing your favorite Christmas morning traditions! Out of habit, I’m almost always awake before my kids every morning. It’s no different on Christmas morning: I wake up, have my coffee, shake the fog from my mom brain, and then wake up the kids. Except, because it’s Christmas, I change it up a bit. Instead of going to their rooms quietly to rouse them from their slumber, I crank up the Christmas tunes. 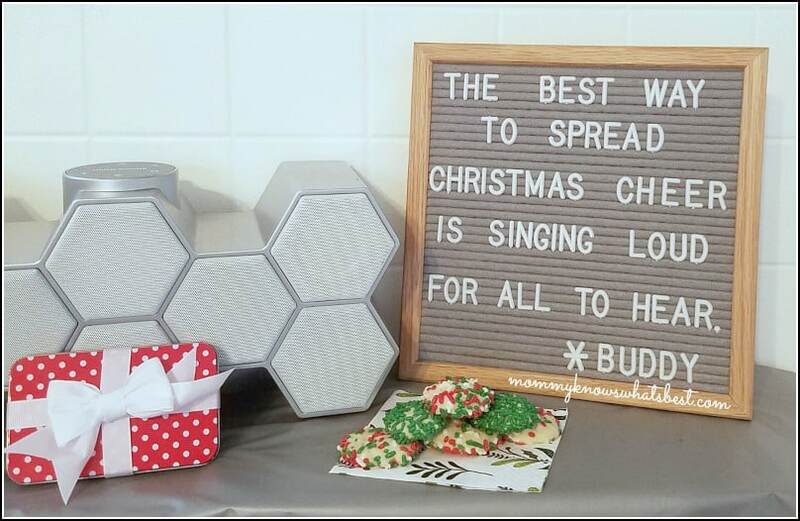 When I was little my parents would always play Bing Crosby, but my kiddos are huge fans of Pentatonix, so I turn up the volume on my portable bluetooth speaker and play our Pentatonix Christmas playlist. Even my grumpiest child wakes up happy when Christmas music is playing! They can’t all help but to wake up happy and excited! It really sets the mood for the whole day. When my siblings and I were kids, my parents would only let us go so far down the stairs on Christmas morning. Imagine all five (yes, five!) of us lined up, trying to get a peek of what was waiting for us downstairs! It really built up the anticipation of what we knew was coming, plus it kept us from tearing into the presents. 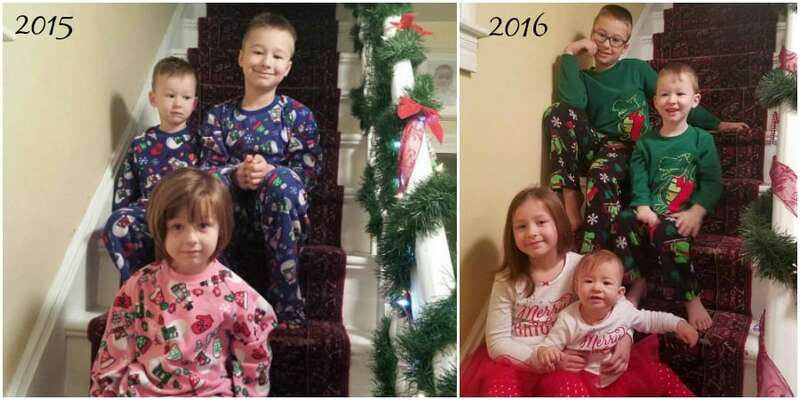 When my kids are all awake, I line them up on the stairs for the traditional Christmas morning photo. They’re all in their matching jammies and beaming with excitement, so it’s pretty easy to snap a nice photo of them all together. Someday they’ll appreciate seeing all of the photos from their childhood, and I hope they’re even inspired enough to recreate a few! I love comparing each year and seeing them grow. It’s both heartwarming and bittersweet to see them all grow up so fast! Once the excitement from opening presents has died down, it’s time to eat! Our Christmas breakfast is more like a breakfast feast compared to what we usually have for breakfast! and a cup of hot cocoa! Gotta have a little bit of sweet with the savory, right? This breakfast is special, because we all sit down together to count our blessings and spend time together as a family. We usually don’t eat this meal together in the mornings since we’re all up at different times, so it’s nice to sit at the table all at the same time. 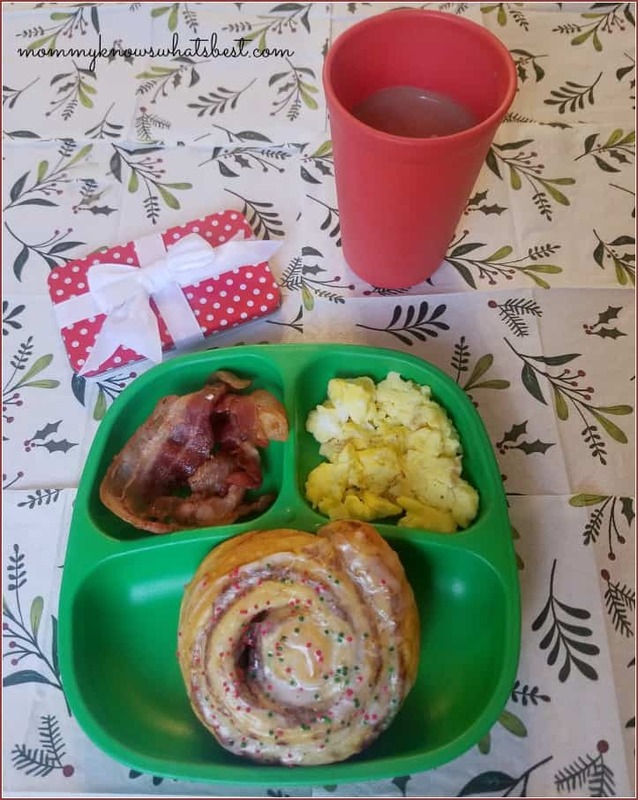 I like to keep breakfast festive, which is easy with our Re-Play Recycled red and green tableware! Note: Hot cocoa has been cooled down with a little milk in these cups! If you’ve been following me, you know my love for Re-Play Tableware. These divided plates are great for our breakfast. It keeps everything separate and portions everything just right. Need a last minute gift? You can also send a Re-Play Gift Card by email! Many thanks to Re-Play for sending us these plates and cups for our Christmas morning traditions! Be sure to follow them on Facebook and Instagram. A little birdie told me that they’re going to be unveiling new products and new ways to shop! Share with us! What are your Christmas morning traditions? Is there one that is unique to your family? Leave a comment below! How heartwarming that was. It reminded me of when I was that small. My mother used to love watching us open our presents and I had dolls galore. Breakfast was also a big part of the day and so was Christmas dinner with some relatives. Merry Christmas, Marissa to all of you. I can’t get over how small Lia looked just 2 years ago. I love the idea of waking everyone up with Christmas music! One of my favorite traditions is our Christmas morning breakfast. It’s our “family time” before leaving the house for the day. 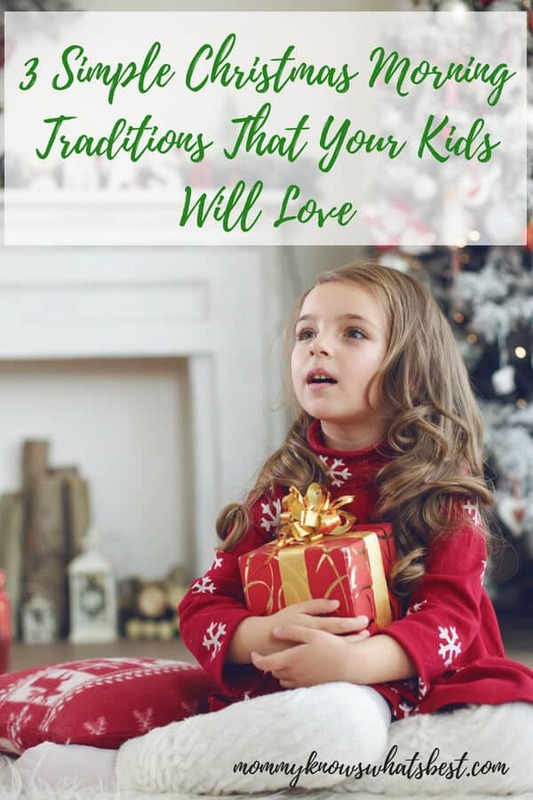 You have some great Christmas traditions. The Christmas Music Alarm is a neat idea. Heartwarming stories such as these are the real stuff of life. Memories, children, family, love. I grew up yearning all year long for the warm lights and the crackling fire during the cold and snowy Christmas seasons in suburban Montreal. My sister and I would get our snacks and watch the classic Rudolph, Frosty, The Grinch and Merry Xmas Charlie Brown specials on TV every Christmas! When I was a teen, my father and I would drive down to the shelter on Christmas Eve and deliver bags of clothes and food. As a blessed dad of two wonderful boys, we love attending the Nativity service with live animals at a historic church in the city, and s’mores and apple cider are always around! The traditions of family are so special and so important. Glynis, that all sounds so wonderful! So much quality family time, it’s no wonder your kids have continued the tradition. Thanks for sharing!